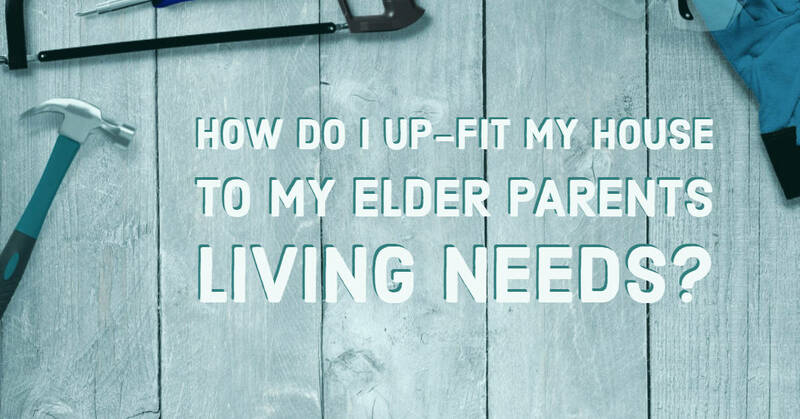 Whether it is a stroke, diabetes, Parkinson’s disease, low vision, or just old age and senility, eventually we will all reach a time in our lives where we will need to depend on somebody else to help take care of us. And depending on the particular situation, it can mean moving in with your loved one or moving into a retirement community. Although both destinations could be a huge change for your elderly parents, if they decide to move in with you, know that it could be a stressful and overwhelming change of lifestyle for you and your parents. You would like your house to be a healthy place where all members of the family feel welcome, safe and comfortable. As your parent’s age, you will have to make a few changes to your house in order to keep them healthy and happy. Whether your elder parents are moving into your house, or you just need to ensure enjoyable and safe visits, the good news is that there are several simple and easy updates you could make to ensure the comfort and security of your parents. Keep in mind that limited mobility is usually one of the most prevalent issues that elders face as they age. This is why it is vital to concentrate on some home safety tactics which can also help preserve independence. You can keep your home welcoming and safe with these excellent upgrades that prioritize senior safety. Although they are the most evident, slippery surfaces aren’t the only danger underfoot. You should make all floors slip-resistant, like by the addition of non-skid mats underneath area rugs (or get rid of your area rugs completely). Remember that trips are equally dangerous as slips; as a result, try to eliminate all trip points such as thresholds whenever possible, or at least reduce their height. If your parents use walkers, you can add Cratsley, low-pile carpeting. Also, review the slip ratings of tile, hardwood and laminate flooring to ensure all high-traffic areas are safe for your parents. A high-quality shower bench can help eliminate slipping risks, giving your elder parents the independence and comfort to shower with limited assistance or on their own. A lot of modern benches are easy to erect inside the bathtub or shower; that being said a transfer bench can add more security and safety as your loved ones enter and exit the shower. Some transfer benches are reversible and incredibly sturdy, which means they could accommodate all types of bathrooms and can support as much as 400 pounds. For older folks who live on the third or fourth floor, stairs could be quite dangerous. This is why handrails, on both sides of a staircase, are a must. Also, lighting is critical; therefore, you should make sure your entire stairway is properly lit from top to bottom. You could add a lighted handrail or even install lighting underneath each stair. Also, clearly defined steps which indicate where the edges of the tread are could help prevent falls. An effective home automation system can provide both comfort and safety. For example, a smart thermostat could auto adjust to keep your elderly parents warm and cozy, while automated lights could be controlled remotely. You can program them to turn off and on at specific times of the day. Also, you can even set up high-quality motion sensors to ensure that nobody is left to fend for themselves in the dark. In case you are not familiar with home automation, you can consider using the Nest Smart Thermostat or Philips Hue smart light bulbs. Both of them are compatible with a variety of other smart appliances and are very affordable if you want to turn your home into a safer and smarter home for your parents. Well, you may not think a lot about turning your doorknob, but for your elderly parents, it could really be quite a chore, or even very painful, in case they have arthritis or any other similar condition. By simply replacing your door knobs with the latest lever-style hardware could make life so much easier for your parents. Also, keep in mind that levers are the best when it comes to faucets while illuminated rocker switches are way better compared to the conventional toggle light switches. It is worth mentioning that one of the simplest ways to improve home safety for all seniors in your home is installing grab bars and handrails. Bathrooms, staircases, hallways, and bedrooms could benefit if you add safety bars to help keep all your loved ones secure and stable while they move about your home. A lot of companies make attractive and sturdy grab bars that are ADA compliant and can withstand as much as 500 pounds of sheer pressure. These bars provide more stability in the shower, bath, near the toilet, or almost anywhere else in your home. Fumbling with packages, keys, and the mail can all distract or unbalance a person exiting or entering a home. Apart from providing lighting at all the entryways, make sure you have a bench, table, or another suitable surface nearby where your parents can put things down. Although it may seem like overkill at the start, a good security system could offer an added level of security and comfort you and your elder parents need. A lot of advanced and sophisticated security systems allow you to check in remotely on a regular basis through your computer or smartphone. This can help you keep an eye on your parents all day long. Another great thing is that you could program alerts to tell you if anyone leaves your house or yard unexpectedly. This is an especially useful and invaluable feature if your elder folks are prone to wandering or have memory loss. Your staircase is not the only area of your home which needs good lighting when your parents move in. Keep in mind that a dark room is often an invitation to a fall or bump; therefore, make sure that there is proper lighting all rooms, hallway, and even doorway. Also, note that entryways can be particularly dangerous when they are not well lit. Another important step that you can take to make your home elder-friendly is affixing bed rail. It will help keep your elder family members safe and steady while they get out or get in bed. There are some incredible products available on the market that can fit snugly between the box spring and mattress. Some bed rails even include pockets to hold magazines, books, or anything else that your loved ones need close at hand. These bed-assist bars can also help with changing sleep positions during the night. Whether it is required only temporarily for help following surgery or permanently to provide long-term support, these products offer a simple and economical solution for your parents’ bedtime safety. You can add extra grip to the stairs, which is another incredible way to avert stair-related falls and injuries. You can add grip tape to all non-carpeted stairs or make use of non-slip tread mats which can work on stairs without or with carpets. Make sure you do this to all the staircases in and outside the house. In case your older family members are moving in and frequent use of stairs is not avoidable, you may want to consider buying a high-quality stair-assist chair. Some of these chairs are available with a lifetime guarantee. You could try all or some of these easy and simple changes yourself. By doing it, you will make your house elder-friendly, safer, and even open it up to plenty of buyers in case you decide to sell! Also, by making these upgrades, you could contribute to living in happiness, peace, dignity, good health and comfort. Keeping everyone comfortable and safe in your house is important—in particular when your family members or parents get older. So, make sure that your parents always feel secure and welcome by considering and providing the support they require. Begin by considering some of these simple home adjustments and upgrades to increase safety for all the seniors in your life. Always keep in mind that you cannot compromise the well-being and safety of your parents.